UH-Clear Lake President Dr. Bill Staples, left, thanks Pat and Wendell Wilson for all they have done for the university at the dedication of the park being built to honor them. A light breeze, plenty of sunshine and a beautiful space made for a perfect setting on a Saturday afternoon in early May as University of Houston-Clear Lake friends gathered for the dedication of the Pat and Wendell Wilson Park, named after UH-Clear Lake Associate Professor Emeritus Patricia Potter Wilson and Capt. Wendell M. Wilson. UHCL Provost Carl Stockton, left, explains a little local history to Education Dean Mark Shermis, who is relatively new to the campus. Through a special legacy gift from the Wilsons and a vision to protect the university’s natural setting, the enhanced park will include a native garden inspired by Wendell Wilson as well as a pond officially named Potter Pond to honor Pat Wilson. 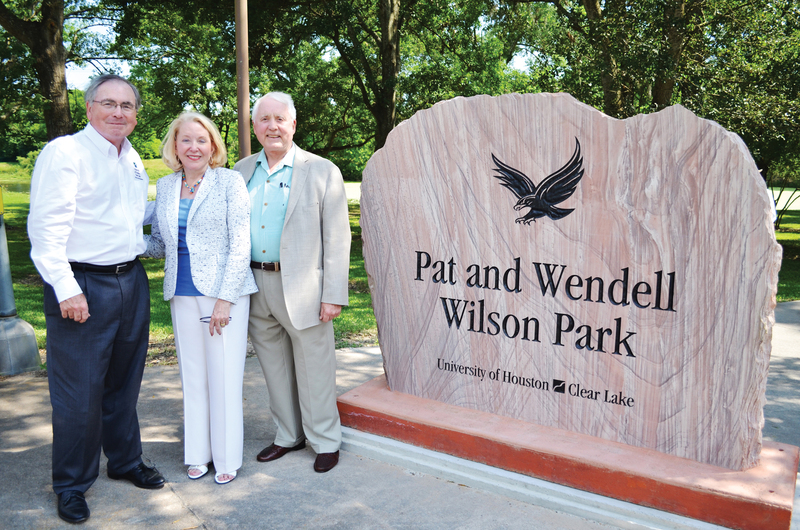 Pat Wilson, a UHCL Distinguished Alumna and associate professor emeritus in UHCL’s School of Education, and her husband, Wendell, a former Air Force fighter pilot and retired Delta Airlines captain, have shown their support and passion for UHCL for decades. 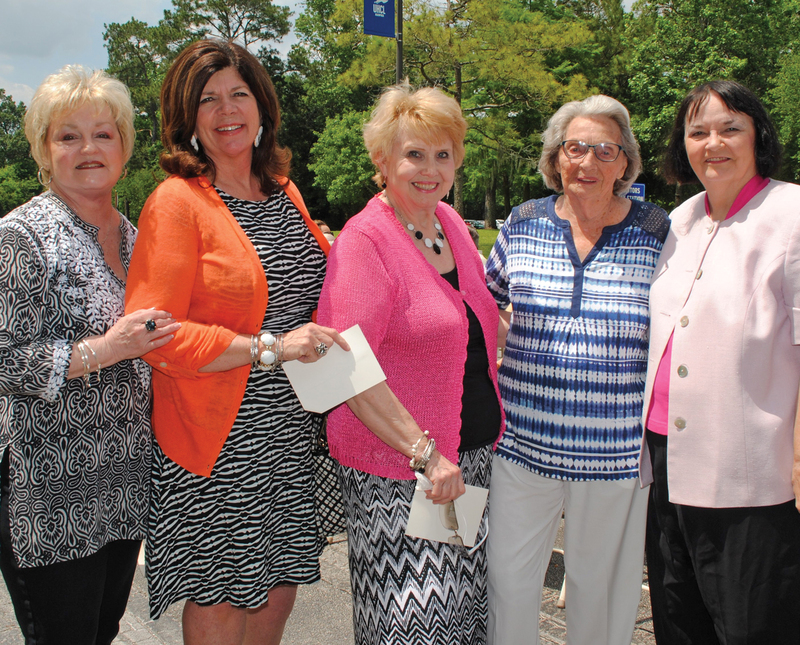 Many long-time friends of the Wilsons were in the crowd for the dedication of Pat and Wendell Wilson Park May 3 including, from left, Betsy Bush, Kippy Caraway, Martha Ferebee, Lois Mohrhusen and Pat Hargrove. An author of seven books and a former teacher for the military and Clear Creek School District, she received her master’s degree from UHCL in 1979 and her Doctorate in Education at University of Houston in 1985 where she received the UH College of Education Outstanding Graduate Student Award and was later selected as a UH Distinguished Alumna. In 1988, she joined the faculty in UHCL’s School of Education where she helped shape the lives of educators in the greater Houston area. While a professor at UHCL, she received the prestigious President’s Distinguished Teaching Award and was the university’s Piper Award Nominee for Excellence in Teaching. A pilot with the U.S. Air Force, Wendell Wilson flew more than 300 combat missions in Vietnam before returning stateside to train experienced South Vietnamese fighter pilots and others. 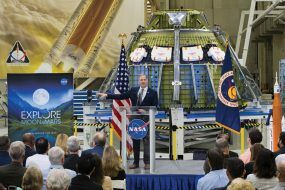 After fulfilling his military commitment, he was hired as a pilot for Delta Airlines where he worked for 33 years until retiring in 2002. 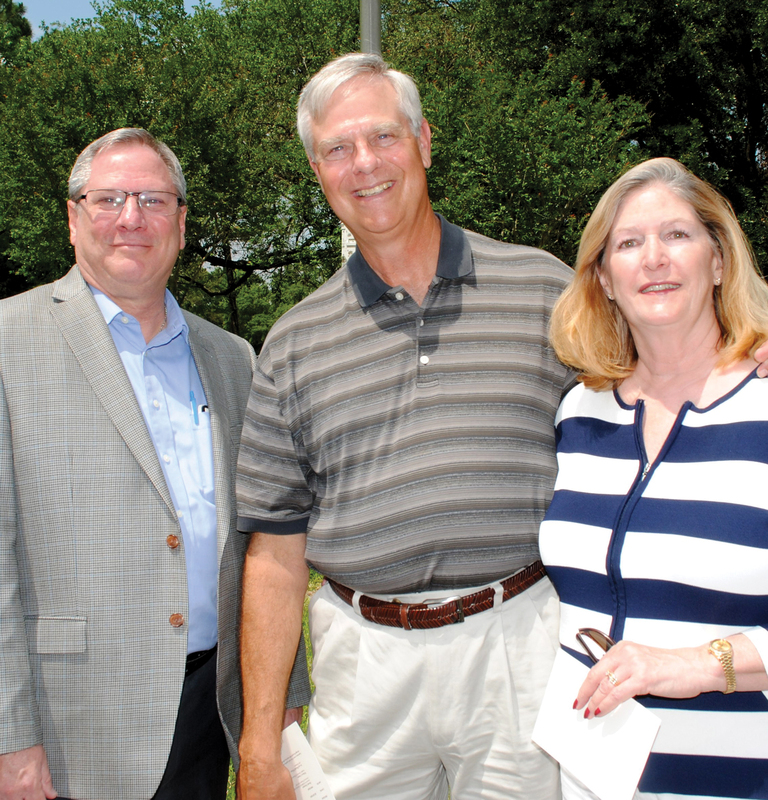 Former Seabrook Mayor Gary Renola and his wife, Elaine, right, and former UHCL Associate Vice President Dion McInnis were among the many at the Wilson park dedication. McInnis began plans for the park before retiring. 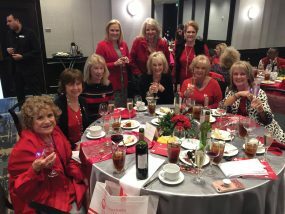 Their volunteer service includes serving on boards and working with local community organizations such as the Lunar Rendezvous Festival, Friends of Evelyn Meador Library and Freeman Memorial Library, as well as the UHCL Alumni Association. 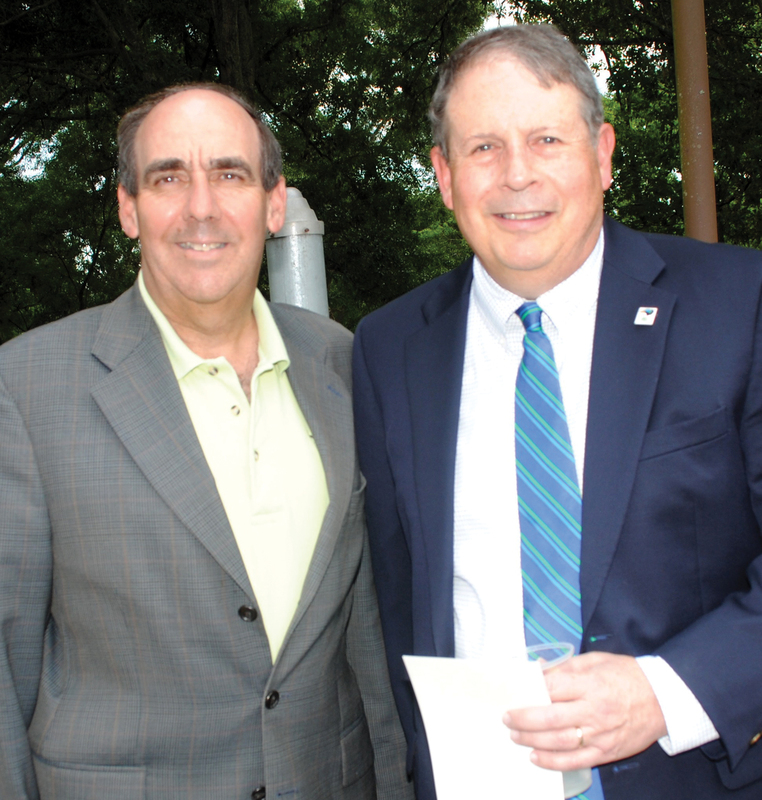 In addition to their volunteer service, the two have been staunch supporters of UHCL students through the creation of the Dr. Patricia Potter Wilson School of Education Outstanding Students Scholarship Endowment and through financial contributions to many other scholarship programs. In 2009, the Wilsons were honored for their continued support with the President’s Cabinet Philanthropy Award and, earlier this year, were presented the President’s Cabinet Leadership Service Award. Their experiences with the military and as world travelers, which includes visits to over 180 countries, reinforced their views about the importance of UHCL’s Liberty Bell project, leading to Pat being named a “Belle of the Bell” and Wendell recognized as a “Man of Honor.” In 2014, the university’s Office of Veteran Services honored Wendell’s service in the U.S. Air Force by renaming the office the Capt. Wendell M. Wilson Office of Veteran Services.